Broad economic factors routinely have a jolting influence on the stock market, forcing traders to react both quickly and over time to adjust to new market conditions. 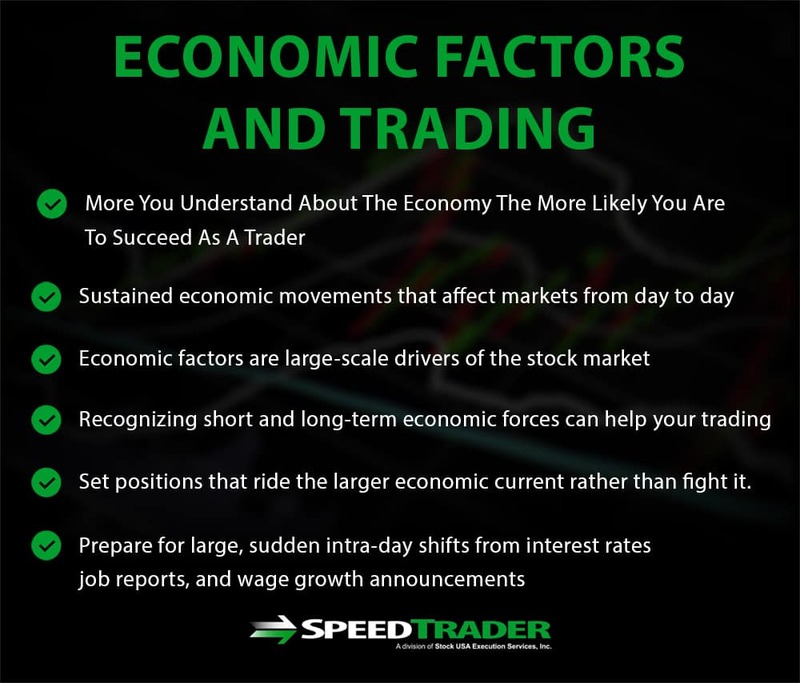 Understanding the types of economic factors that affect the market and how they influence it can go a long way toward improving your profitability as a trader. 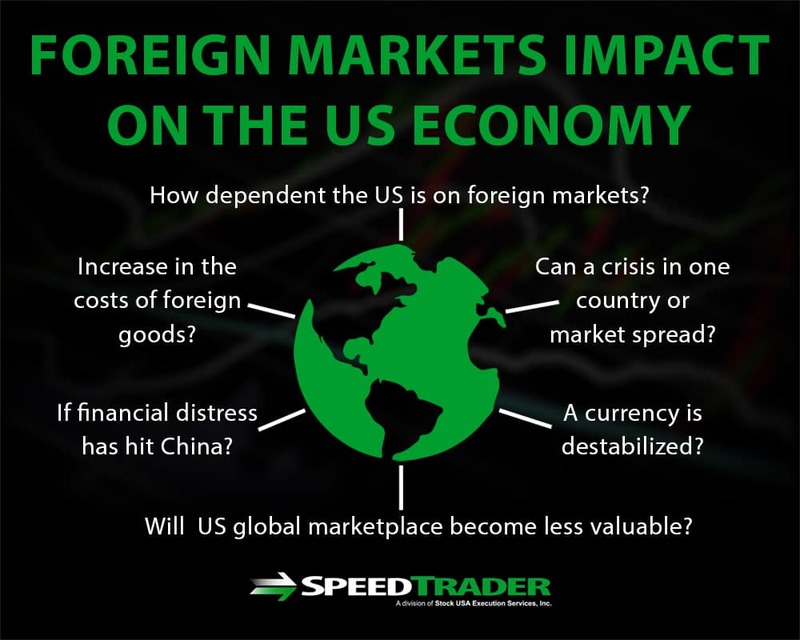 While some traders might find economic announcements and global news inherently interesting, there are a variety of reasons why every trader – from day traders to long-term investors – should pay attention to the economic factors that impact the stock market. First, the more you understand about the economy, the more likely you are to succeed as a trader. Economic factors are in many cases the large-scale drivers of the stock market’s fortunes, whether in specific sectors or across the market as a whole. Recognizing the economic forces at play over both the short- and long-terms can help you hone your trading strategy and set positions that ride the larger economic current rather than fight it. Even day traders who don’t hold positions overnight should pay attention to economic factors. Announcements about interest rate changes or the release of reports about job and wage growth can cause large, sudden intra-day shifts in the way the markets are trading. At the same time, sustained economic movements can dramatically affect the way that the markets are trading from day to day – for example, economic factors may influence whether the stock market is highly volatile or trending strongly. 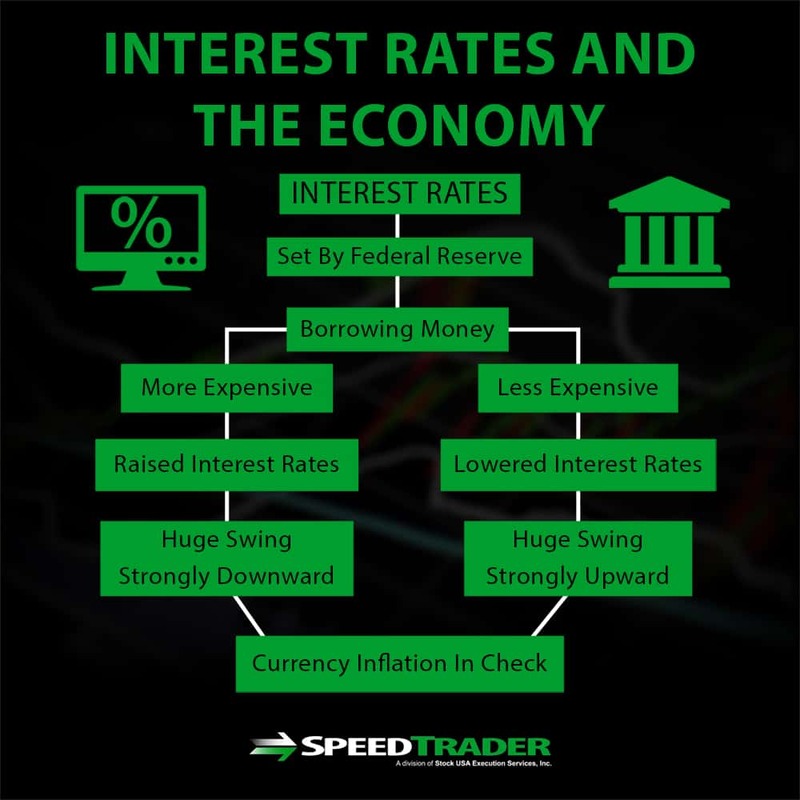 Interest rates are one of the most important sets of numbers across the entire economy, including the stock market. Interest rates are set by the Federal Reserve as a way to make borrowing money more or less expensive, and in the process keep currency inflation to within an established target rate. Changes in interest rates affect the entire economy in myriad ways. When interest rates are high, it is more expensive for consumers and businesses alike to borrow money – which can cause people to think twice about buying a home or a car or to borrow money to hire more employees or purchase new equipment. On the other hand, low interest rates can make it easier for the economy to expand. It may be unsurprising, then, that interest rates have a big affect on the stock market – after all, stocks’ values are ultimately tied to how profitable their underlying companies are, and profitability may be restricted when interest rates are high and consumers and businesses are buying less stuff. Thus, interest rate announcements by the Federal Reserve can cause huge swings in intra-day trading and can cause the stock market to trend strongly upward – in response to lowered interest rates – or downward – in response to raised interest rates – for months afterward. Traders can keep an eye on interest rates by watching for announcements by the Federal Reserve. Typically, the Federal Reserve gives several days’ notice of any upcoming announcement, at which point rumors about potential changes will begin to circulate. Inflation is the rate at which a currency devalues each year. For example, an inflation rate of 1% means that today’s $100 bill will only be worth the equivalent of $99 in one year’s time. While economists have some difficult pinning down the exact causes of inflation, raising interest rates is one of the best methods the Federal Reserve has to prevent inflation rates form skyrocketing. Like interest rates, inflation rates have a number of effects on the economy that can be hard to tease apart. Interest rates that are too low can shake consumer confidence, which hurts businesses, while interest rates that are too high can make it too expensive for consumers to purchase goods. High inflation is particularly bad for businesses because it also devalues their monetary gains. 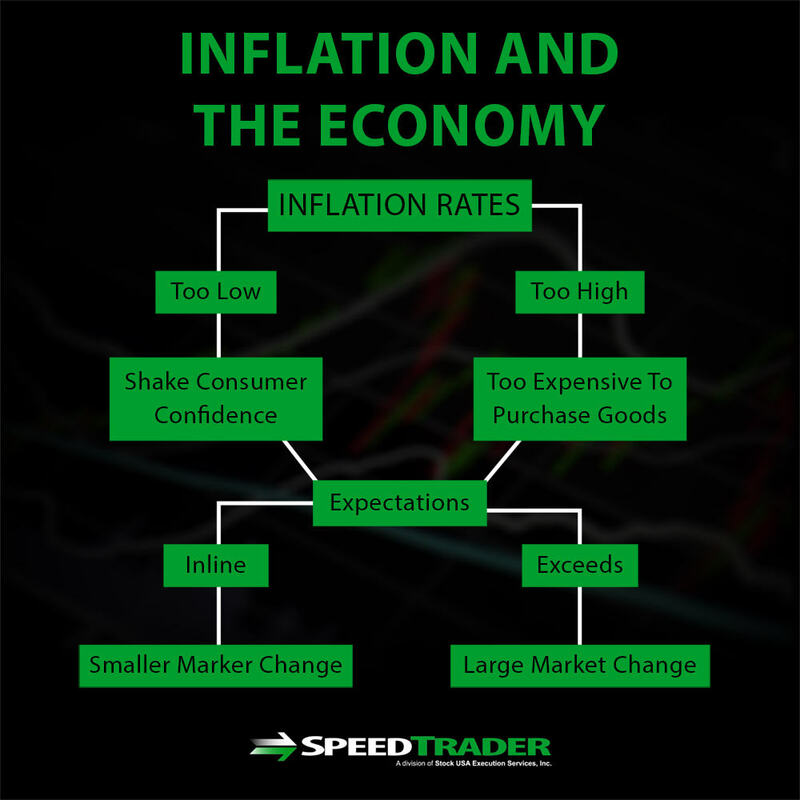 The stock market expects some small changes in inflation rates, so not every announcement of inflation rates will cause a market change if the announcement is in line with expectations. However, inflation announcements are typically negative for the market, both intra-day and potentially over a period of weeks or longer, if they greatly exceed the changes expected by investors. Traders can track changes in inflation rate through the Bureau of Labor Statistic’s Consumer Price Index, which is released monthly. Politics, both domestic and international, can have a large influence on the stock market. In terms of domestic politics, this can best be seen when major elections – like the mid-term or presidential elections – occur. Typically, investors see one candidate as better than the other as offering better policies for increasing corporate and shareholder profits or for improving the overall economy, which can cause large multi-day spikes in the way the market is trending. The US’s trade war with China is an example of how international politics can also dramatically affect the marketplace. Uncertainty about the economic ramifications of this political fight – which has specifically been fought with tariffs, which affect the price of good for consumers and businesses – has translated into volatility and negative price movements in the stock market. Unlike interest or inflation rates, politics is not always overtly economic, which can make it difficult for traders to parse out what political news will have an impact on the market and what news will not. The best resources for following how politics may affect the stock market, and whether that impact will be positive or negative and short-lived or long-term, are often financial news outlets. The health of foreign markets – in Europe, Asia, or elsewhere – can sometimes, but not always, have an impact on US markets. The main determinant of whether foreign markets will affect US markets, and how dramatic that impact may be, is how dependent US corporations or consumers are on those foreign markets. In many cases, investors worry that crisis in one country or market may spread because of the global nature of the companies that make up the large US exchanges and the potential increase in the costs of foreign goods if a currency is destabilized. In other cases, such as has been the case when financial distress has hit China, investors worry that the growth of US companies will slow as their global marketplace becomes less valuable. Still, it can be hard to predict how actions in foreign markets will generate a reaction in US markets. Typically, reactions from foreign market movements are short-lived – on the order of days to months – and will not affect long-term investors, although day traders and short-term investors will need to be wary of this economic factor. While it is possible for traders to monitor foreign stock exchanges just as they would US exchanges, financial news services are a more sustainable way to keep an eye on foreign stock activity that could impact the US. 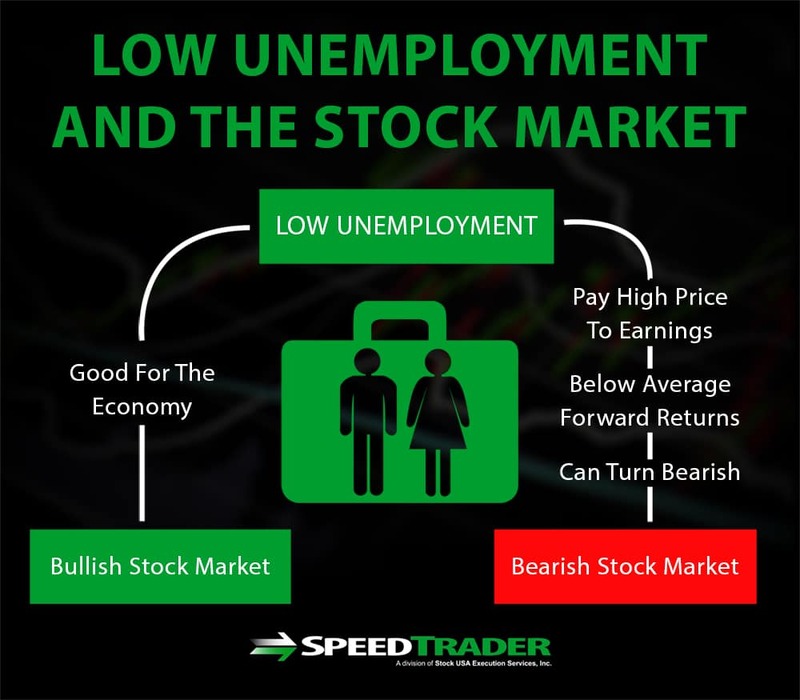 The relationship between unemployment rates and the stock market can be complex. While it might intuitively seem as if lower unemployment is good for the economy and therefor must be associated with a bullish stock market, that is not always the case. Instead, when unemployment is low, investors tend to be more willing to pay high price-to-earnings ratios for companies, which can turn bearish since high valuations are associated with below average forward returns. That’s not to say that high unemployment is good for the stock market, either. High unemployment typically signals that the economy is in trouble and that consumers and businesses are not likely to spend money, which is bad for corporations across the board. Thus, like for inflation rates, there is a sweet spot when it comes to matching unemployment rates to stock market outlook. Unemployment rates are typically announced monthly by the Bureau of Labor Statistics in what have become known as jobs reports. These reports can cause wild intra-day swings in the stock market, even when there is little news or it is difficult to interpret the jobs report’s findings in the context of what it means for the broader economy. In addition, jobs reports can give investors comfort or make them wary, which can influence longer-scale changes in the stock market. Reports of economic growth and projections of future growth are a frequent trigger for intra-day and multi-day swings in the stock market. In the same way that corporations need to perform on both reported profits and projected profits during earnings reports, economic growth announcements typically need to meet investor’s expectations of both current and future growth in order to cause a significant uptick in stock prices. While disappointing economic outlook reports may not have much of an effect in a bullish market, they can have a significant effect in volatile or bearish market conditions. Like jobs reports, economic growth reports can be difficult to interpret in the context of the both the economy as a whole and the stock market. However, investor sentiment is usually clear soon after the report’s release and the effect can be intra-day or sustained over a period of days to weeks. Economic growth reports are typically released quarterly by the Bureau of Economic Analysis. The stock market is one part of the overall economy, but it does not stand alone from the rest of the economy. A variety of economic factors, including interest and inflation rates, overall economic growth, unemployment, and even politics, can influence the stock market on both intra-day and longer timescales. Smart investors need to be aware of what economic factors can impact the stock market, when and where changes in these factors are announced, and how to trade around them. Mint Global Markets, Inc. (“Mint Global”) conducts business under the name Speedtrader. Mint Global is a member of FINRA and SIPC. Check the background of Mint Global Markets, Inc., on FINRA’s broker check. Please log into your account regularly and report any inaccuracies or discrepancies. Inquiries, concerns, questions or complaints should be communicated to the above email, fax, or mailing address with Attn: Compliance. Oral communications should be re-confirmed in writing to protect your rights or via fax. Nothing in this website should be considered an offer or solicitation in any jurisdiction where we are not authorized to do business or where such offer or solicitation would be contrary to the local laws and regulations of that jurisdiction. All investing involves risk, including loss of principal invested. Past performance of a security or strategy does not guarantee future results or success. No information provided by Mint Global, directly or indirectly, should be considered a recommendation or solicitation to adopt any particular trading or investment strategy, or to invest in, or liquidate, a particular security or type of security. Information provided by Mint Global on its Twitter, Facebook or Blog pages is for informational and educational purposes only and is not intended as a recommendation of any particular security, transaction or strategy. Commentary and opinions expressed are those of the author/speaker and not necessarily those of Mint Global. Mint Global does not guarantee the accuracy of, or endorse, the statements of any third party, including guest speakers or authors of commentary or news articles. All information regarding the likelihood of potential future investment outcomes are hypothetical. Future results are never guaranteed. Any examples that discuss potential trading profits or losses may not take into account trading commissions or fees, which mean that potential profits could be lower and potential losses could be greater than illustrated in any example. Day Trading Can Be Extremely Risky. Day trading is subject to significant risks and is not suitable for all investors. Any active trading strategy will result in higher trading costs than a strategy that involves fewer transactions. Please see the Day Trading Risk Disclosure Statement. Customers who want to use their accounts for day trading must obtain the broker-dealer's prior approval. Customers must also be aware of, and prepared to comply with, the margin rules applicable to day trading. There are special risks involved with trading on margin. Please see the Margin Risk Disclosure. From time to time, Mint Global presents webinars, which may be accessed via links on this site and through other content providers, in order to offer an opportunity to hear from a professional day trader. The speakers are not employed by, registered with, or associated with Mint Global. The information and opinions expressed in any webinar are those of the speaker/presenter and not necessarily those of Mint Global. Mint Global does not warrant or guarantee the accuracy of the information provided in any webinar presentation. Speakers may state opinions or may make statements concerning their own investing experience. Their opinions or experiences may not be representative of the opinions or experiences of other traders. No statement in any webinar should be considered as a prediction, promise or guarantee of future performance or success. Some of the speakers are employed by or affiliated with companies that provide marketing services for Mint Global, which means that those speakers are directly or indirectly compensated for marketing Mint Global’s services. They are not separately compensated for appearing in any webinar or for the content of their remarks in any webinar. Mint Global does not recommend any specific investment or strategy, including a day trading strategy. Customers are solely responsible for determining whether any particular transaction, security or strategy is right for them. Testimonials on this website may not be representative of the experience of other customers. No testimonial should be considered as a guarantee of future performance or success. Users are solely responsible for making their own, independent decisions about whether to use any of the research, tools or information provided, and for determining their own trading and investment strategies. Mint Global provides information about, or links to websites of, third party providers of research, tools and information that may be of interest or use to the reader. These service providers are not affiliated with Mint Global, which makes no warranty with respect to the contents, accuracy, timeliness, suitability or reliability of any information displayed or provided by any third party, and makes no assurances with respect to the results to be obtained from their use. Mint Global receives compensation from some of these third parties for placement of hyperlinks, and/or in connection with customers' use of the third party's services. Mint Global does not supervise the third parties, and does not prepare, verify or endorse the information or services they provide. Mint Global is not responsible for the products, services and policies of any third party. Market volatility, volume and system availability may delay account access, market data, and trade executions. Please see the further, important disclosures about the risks and costs of trading, and client responsibilities for maintenance of an account through our firm, available on this website. Mint Global’s financial statement is available free of charge upon request. Please send all requests to [email protected]. All content is Copyright 1999-2018, Mint Global Markets, Inc.